The popular narrative about the Democratic Divide is all wrong and it’s important that we realise the truth — before it is too late. The Mainstream Media, aided by the political pundit class, is pushing a narrative these days that claims the Democrats are being “pushed to the Left.” In this scenario, the “insurgent” Bernie Sanders campaign has led to the rise of “liberal activists” and “far left progressives” who are challenging the “moderate wing” of the Democratic Party. Indeed, Politico recently ran a pearl-clutching story asking, “Are Democrats Becoming Extremists?” and the Atlantic felt they had to write a reassuring piece entitled, “No, Liberals Don’t Control the Democratic Party”. Many have encapsulated the current struggle as a civil war between the “Clinton Wing” and the “Sanders Wing” of the Party. This characterization is correct in that Clinton and Sanders are personally emblematic of the two warring factions, but they are all wrong when it comes to identifying the forces and philosophies that are driving each group. The mainstream narrative portrays the two Democratic factions upside down and backwards. For example, there seems to be unanimous consent that the Clintonites represent the “Democratic Establishment.” While this may be true in the present moment and from a purely operational perspective, the Clinton Wing of the Party (which also includes Obama) by no means represents historically Democratic principles or indeed the “traditional” Democratic Party positions, policies and philosophies. Rather today’s Democratic elites are “moderate Republicans” who regularly praise Ronald Reagan as their philosophical model while they rarely even mention FDR. These Democratic revolutionaries have created a Party in which the likes of Richard Nixon, George H.W. Bush and even Barry Goldwater might feel at home. It is the Sanders Wing, the ones the Media call the “upstart activists”, who represent traditional, dyed-in-the-wool Democratic principles and values. Indeed, when viewed from an historical perspective, it is clear that the Clinton/Obama faction are the heretics, while the Sanders “Berniecrats” are the guardians of Democratic Party orthodoxy. None will argue that the Republican Party was transformed by Ronald Reagan into a powerful force that galvanised the American people. Reagan ran on several key issues that have since become GOP orthodoxy: small government, cutting taxes, cutting welfare and social services, destroying unions, exalting corporations, cutting regulations and promoting free trade. In short, Reagan sought to undo everything that FDR had achieved under the New Deal. The problem that Reagan had was that New Deal policies were just too popular. Americans had elected and re-elected FDR literally until he died, and his legacy had left the Democrats with an iron grip on Congress, ready to thwart the Reaganites’ attempts to unravel the Great Society. It took a revolution within the Democratic Party to allow that to happen. That revolution was led by the Democratic Leadership Council and its Chair, Bill Clinton. Declaring that “the era of big government was over,” this radical cabal of right wing Democrats proceeded to hijack the Democratic Party and leverage its legislative strength and former reputation to actually enact all of Reagan’s wish list, from “ending welfare as we know it” to signing NAFTA, to deregulating business and rolling back all the New Deal banking safeguards that were enacted after the Great Depression. 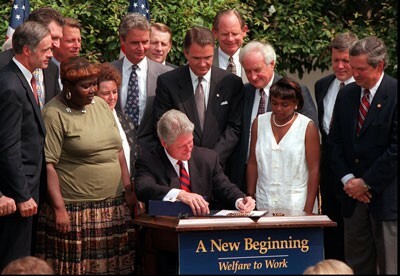 Bill Clinton signs the Welfare reform act of 1996, which threw over 1 million children into poverty. They said “only Nixon could go to China”, and only Bill Clinton, a “Democrat”, could undo what FDR put in place under the New Deal. And he was successful in destroying almost all those programs. There remains only one great pillar of the New Deal that has withstood decades of right wing neoliberal attacks — Social Security. Social Security is the next target for the radical right wing revolutionaries that are currently in charge of the Democratic Party. Like most revolutionary cabals, the Clinton radicals had to keep their plans a secret. Privatising and thus destroying the incredibly popular Social Security program was dynamite. And as the article goes on to explain that the secret plan would probably have been brought to fruition had it not been for the Monica Lewinsky scandal, which forced Clinton to abandon his high ambitions in defense of his Presidency. Fast forward to 2016, when Hillary Clinton was preparing for what she and her fellow DLC inspired “New Democrats” believed would be a clean coast into the White House. After 8 years of revolutionary neoliberalism under Obama, Hillary was confident that she could sell the idea of privatising Social Security to the American people, thereby completing the Reagan wish list and eradicating the last vestiges of the traditional, worker-oriented Democratic Party and replacing it completely with a technocratic political machine that served the interests of Corporate America and Wall Street. The Clintonite revolutionaries needed a Wall Street ally to join in their secret plot to “end Social Security as we know it.” Their partner in crime turned out to be Peter G. Peterson, a multi-billionaire Wall Street scion who had served as US Commerce Secretary under Richard Nixon and was chairman of the Federal Reserve Bank of New York from 2000 to 2004. Peterson then went on to found The Blackstone Group, one of the world’s largest private equity firms. 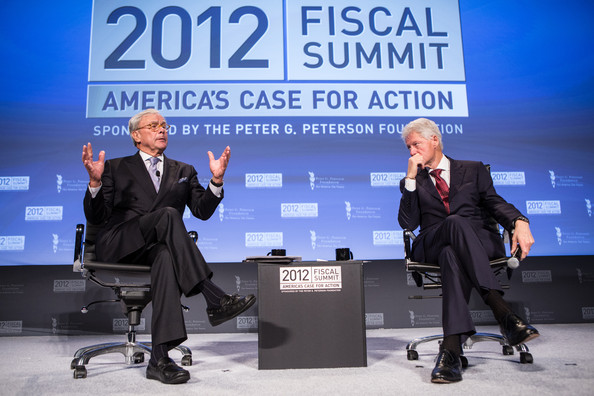 Pete Peterson and Bill Clinton discuss Social Security and Medicare privatisation at Peterson’s “ Fiscal Summit”, which was protested by Bernie Sanders. From 2007 until 2011, Peterson carried on a one-man crusade to push for the privatisation of Social Security and Medicare, spending $458 Million of his own money to promote the idea of turning Social Security over to Wall Street. In this effort, however, he was aggressively opposed by Bernie Sanders, who garnered criticism from the Establishment for maintaining that “Pete Peterson is not a philanthropist,” and condemning Peterson’s efforts to destroy the retirement and healthcare programs that help poor and working class Americans. While Pete Peterson was holding summits and high profile meetings with Bill Clinton, Timothy Geithner, Larry Summers and other economic revolutionaries eager to privatise Social Security, the group’s President, Tony James, was meeting regularly with Hillary Clinton to discuss what a privatisation plan for Social Security might look like. In other words, the secretive discussions started under the Bill Clinton Administration were started up again in 2012, this time with Hillary at the helm. A Washington power player who reportedly turned down a slot in President Barack Obama’s cabinet, James first outlined the retirement savings initiative in a speech a year ago to the Center for American Progress (CAP). The liberal think tank was founded by Clinton’s current campaign chairman, John Podesta, and is run by her former top policy adviser Neera Tanden. James and Blackstone made six-figure donations to CAP that year, and the group gave him a platform to propose a new payroll tax that he said would fund guaranteed retirement benefits. Put it another way: this is just another form of looting. Obamacare was written by the health insurance lobby and look how well that has turned out. Just imagine what sort of cooking ordinary Americans will get from the kitchen of Tony James and his fellow private equity robber barons. namely, privatise your Social Security and give it to her Wall Street buddies. But there’s evidence that Clinton, who seems to be the front runner in the race …, may be considering a national retirement savings program, according to David Sirota at International Business Times. The report is based on a plan promoted by Tony James, president of private equity firm Blackstone Group, one of Clinton’s top fundraisers, and a leading candidate for Secretary of the Treasury. 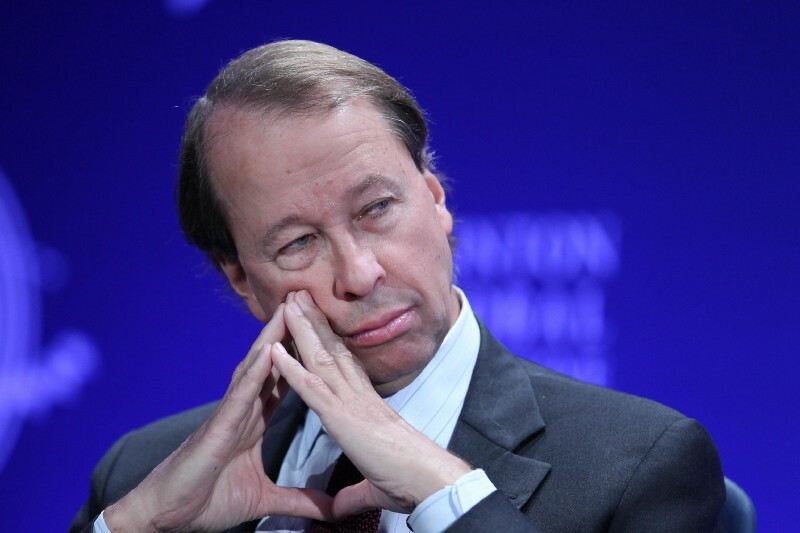 With the Blackstone Group running the Treasury, it was seen as inevitable that there would be a privatisation scheme for Social Security, and that it would lead to a huge payday for the Wall Street managers who would control the various “investment vehicles” into which our Social Security funds will be dumped. James’ language suggests that the vehicles will be “run by professional asset managers,” as in many or perhaps all will be actively managed, as opposed to indexes. As any student of John Bogle will tell you, paying for active managers is a waste of money, but Hillary wants to go that route on an industrial scale so as to further enrich grifters like Tony James (let us not forget that the Blackstone has paid fines in an SEC settlement for charging fees it was not authorized to take, which in most walks of life would be called embezzlement). So there you have it — more Clintonian pay to play politics at our expense. The massive fundraising done by Tony James, the incestuous relationships with Neera Tanden and John Podesta, all would have led to a massive fleecing of the American people, and the last citadel of the New Deal, the crown jewel and pinnacle of Democratic Party success, would have been killed, and the very last bit of FDR’s legacy eradicated. When Hillary lost, however, we dodged that bullet … or did we? I wish I could say that the secret plan to destroy Social Security had been killed, but it seems that that some revolutionary ideas are never without revolutionaries to push them. In the case of Social Security privatisation, none other than Nancy Pelosi is trying to keep the revolution alive. The great investigative bulldog David Sirota may have once again picked up the scent of a neoliberal plot to destroy Social Security. Nancy Pelosi recently gave a floor speech in Congress to honor Pete Peterson, the multibillionaire who dedicated his life and his money to destroying Social Security and Medicare through neoliberal privatisation. Well, in the worst case, it means that if and when a “Blue Wave” puts Congress in the hands of the Democrats, we will see a “bipartisan” move to privatise Social Security. It will be widely praised as practical and necessary; the bill will pass with both Republican and Democratic support, and President Trump (or Pence) will sign it into law. That is of course unless Bernie Sanders and his FDR traditionalists can stop them. The current Democratic Establishment is run by those self-same Economic Royalists; the robber barons whose hatred FDR welcomed are now met with open arms and warm receptions by the revolutionary Leadership that has seized control of the Democratic Party. These radicals have taken the Party of of FDR, JFK, LBJ, RFK and turned it into the Democratic Party of Goldwater, Nixon and Reagan. Previous Post - Previous post: “Blue Dogs” Have Destroyed the Democratic Party and They Need to Go. NOW!